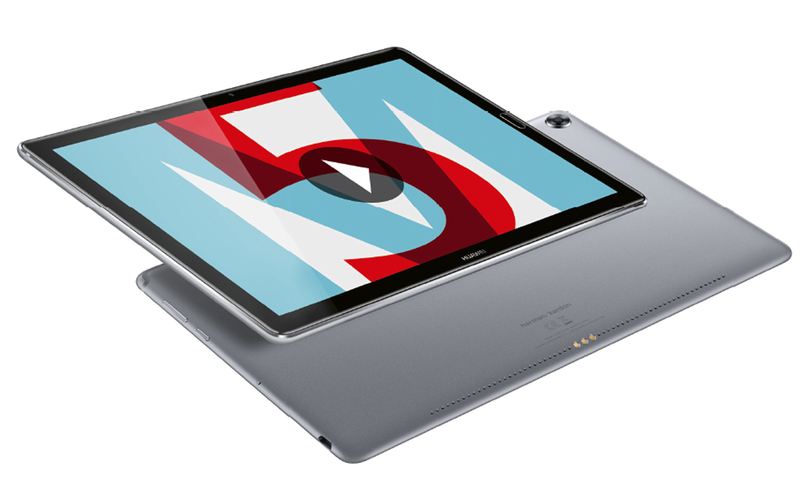 The Huawei MediaPad M5 Pro is a 10.8-inch high-end tablet that comes with an active M-Pen stylus. Its highlights are a full metal body, a fast Kirin 960 processor, up to 128GB of storage, build in LTE and Android 8.0 Oreo. With the active pen, you can take handwritten notes, draw and more. Here is everything you need to know about the Huawei MediaPad M5 Pro. The Huawei MediaPad M5 Pro is very similar to the MediaPad M5 10.8. In fact, most of the internal hardware and its design are almost identical. Unlike the standard version, the M5 Pro comes with an active pen called M-Pen and special software for the stylus. Another build in standard is 4G LTE and it features a bit faster processor. Like its sibling, the MediaPad M5 Pro offers a full metal and premium-feeling body. On the top and bottom are two soundbars with two speakers each. There’s a USB Type C port, a microSD card slot, and a nanoSIM slot. There is no 3.5-millimeter audio jack. Instead, there is a USB Type C to audio jack adapter included. The cameras offer a resolution of 13 and 8 megapixels. Like most premium devices nowadays, it features a fingerprint reader. Thanks to a pin-connector on the bottom you can connect an optional keyboard cover. Inside runs a HiSilicon Kirin 960 octa-core processor which offers a bit higher speed as the Kirin 960s from the standard version. Other specifications include 4GB of RAM and an up to 128GB internal storage. The microSD slot can hold cards with a capacity of up to 256GB. Like the standard version, the 10.8-inch screen has a very high resolution of 2560 x 1600 pixels. Huawei is shipping the tablet with Android 8.0 Oreo and its EMUI interface. With that, Android is customized quite heavily. There are a lot of apps pre-installed as well. Some of them can be removed but not all of them. As I mentioned earlier, the Huawei MediaPad M5 Pro supports active pen input. In fact, it ships with a pressure sensitive stylus called M-Pen. That pen is charged using a build in USB Type C port. It has two buttons on the side which can act as mouse buttons and shortcuts. Just like Samsung’s S-Pen, it supports 4096 pressure points. There are a couple of software features included that support the M-Pen. Using the stylus you can quickly take screenshots and edit them. Handwriting recognition is built into the keyboard so you can use the pen to input text everywhere. In addition to that, there is a notes app with handwriting support pre-installed. Other apps include a handwriting calculator and a drawing app. If you are looking for a similar tablet with pen input, you can check out the Samsung Galaxy Tab S3. By now, both tablets are priced very similarly. The Galaxy Tab S3 is the only one with a Super AMOLED screen though. In the past, Samsung has been a bit better with updates as well. The Samsung Galaxy Tab S4 is available now too. Other competitors are the Apple iPad Pro with iOS and the Apple Pencil or Windows tablets like the Microsoft Surface Pro or Lenovo MIIX 520. If you are looking for a very affordable device with pen support, you can check out the Samsung Galaxy Tab A 10.1 with S-Pen. The Huawei MediaPad M5 Pro is a 10.8-inch premium tablet that included LTE and an active M-Pen stylus. It features powerful hardware, a high-resolution screen, Android 8.0 Oreo and a high-end design.